The problem with Google Chrome security warnings: it blocks perfectly good websites. I understand it's early days (May 2018) but it is still presenting warnings on it's own web sites, so what chance do non-Google websites stand? www.google.com normally uses encryption to protect your information. When Google Chrome tried to connect to www.google.com this time, the website sent back unusual and incorrect credentials. 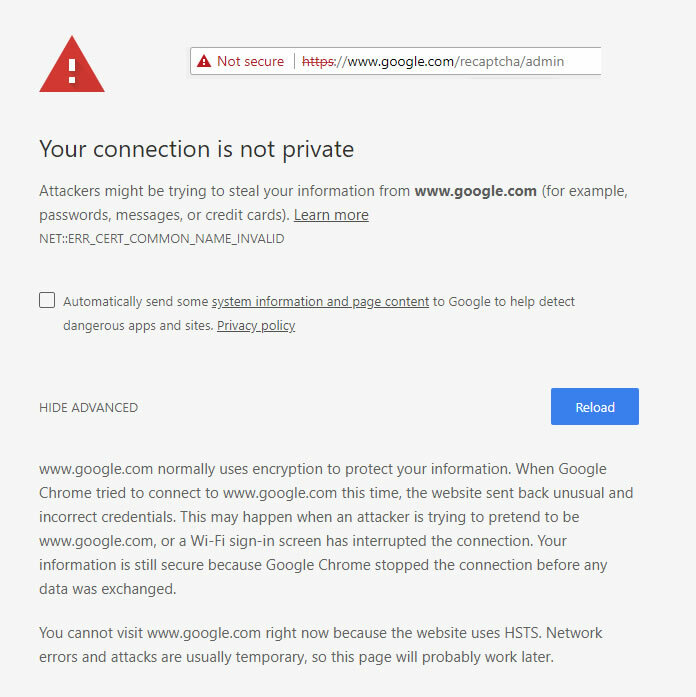 This may happen when an attacker is trying to pretend to be www.google.com, or a Wi-Fi sign-in screen has interrupted the connection. Your information is still secure because Google Chrome stopped the connection before any data was exchanged. "Your connection is not private," "ERR_CERT_SYMANTEC_LEGACY,"
If the error mentions SHA-1 or Symantec, ask the site owner to update the site's certificate. Learn more about why SHA-1 and Symantec-issued certificates are not supported. Is Google second guessing it's own detection service? The address is clearly https, so why go down the HSTS path? Is Google aware of flaws in https? *Are we kidding Google: seriously, turn off antivirus software to access a potentially insecure page? Final word: I believe we should be given the final say: after being warned, we should be presented with a link to the offending website with a clear message saying "You have been warned". I say this because the example above did not include a link. I was unable to visit the page until 2 days later when the message mysteriously vanished.